Located at Pattom, right at the heart of the city, Artech Florenza is Trivandrum’s first Sky Villa, where the essence of space is defined by seamless fluidity, well-appointed interiors and abundant natural lighting. 2 & 3 BHK Apartments in eight different plans cater to the client’s diverse requirements. 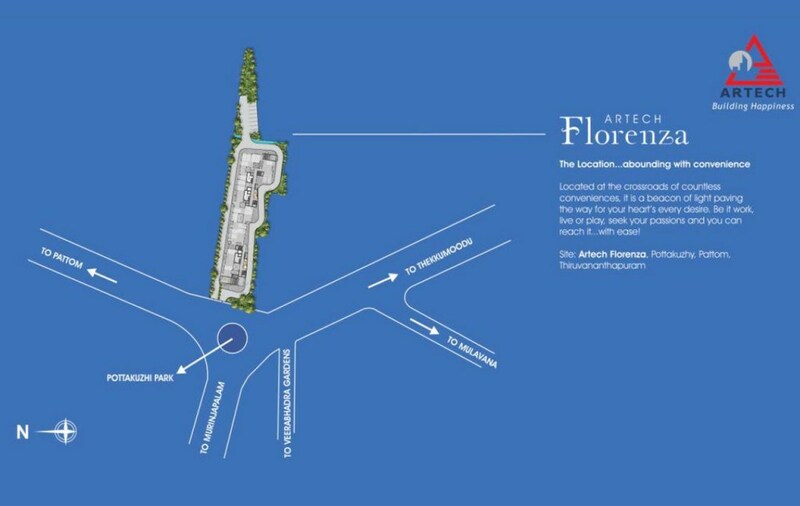 Each unit range in sizes from 1172 – 2263 sq ft. High speed elevators, high level of home automation, roof -top swimming pool, fully equipped air-conditioned Unisex Gym, Multi – purpose hall with open deck party area at the terrace are some among a wide range of amenities offered in Artech Florenza. Deep pile foundation complying with seismic 3 zone. RCC frame structure with brickwork and or concrete block partitions. (All plumbing services passes through the walls are solid block). Concrete grade and Steel grade as per structural consultant’s advice. Lift lobby and fascia wall & floor using composite marble / granite / vitrified Tiles, as per the architect’s design. Staircases using granite / vitrified flooring with hand railing using matt finished SS with or without toughened glass as per architect’s design. Car park Area: Grano flooring with grooves or exterior grade paving tiles. Foyer / Living / Dining using 80cm X 80cm Premium vitrified tiles. Kitchen / Bed Rooms: 60cm X 60cm vitrified tiles. Master Bed Room: Laminated wooden flooring AC4 Grade. Master Toilet: Designer ceramic tile concepts 30cm X 30cm for floor and 45cm X 30cm for walls up to height of 8’ 0”(master toilet). Other Toilets: Designer ceramic tile concepts 30cm X 30cm for floor and 60cm X 30cm for walls up to height of 8’ 0”. Servants Toilet: Ceramic tile 30cm X 30cm for floor and 30cm X 45cm for walls upto 8’0” height. Utility Room: 30cm X 30cm for floor and 30cm X 45cm for walls upto 4’6” height and 2’ above the counter if any. Balconies / Open Terraces / Decks: Rustic / antiskid / ceramic tiles 30cm X 30cm or Timber decking with MS / SS / Glass railings. Soft landscape as per architect’s design also shall be provided. Sanitary fittings: EWC wall-hung, concealed cisterns GEBERIT make, counter washbasin. All sanitary fittings shall be of ROCA / American Standard or equivalent. Faucets: All Faucets shall be single lever concealed diverters CP finish, heavy body metal fittings of Grohe / Roca or equivalent make. Provision for hot water connection shall be provided for overhead shower in each bathroom. Plumbing: All water supply lines shall be in ISI marked CPVC pipes. Drainage lines and storm water drain pipes shall be in PVC. Kitchen & Service area: Wall mounted Faucets / taps would be provided. Stainless Steel Sink multi bowl with drain board of NIRALI make or equivalent shall be provided for the kitchen; Stainless steel sink without drain board shall be provided for the utility and service areas. Towel rods, towel ring, soap dish and health faucets shall be provided inside the toilets. Window shutters: Prefabricated colour anodised aluminum. Door Frames: Main door frame and shutter shall be of seasoned teak wood. Outer face to be PU coated and Inner face melamine finished. Door Shutters: All internal door frames shall be of seasoned teak wood / hard wood with flush door shutter. All internal and external faces shall be melamine finish. Hardware: All hardware shall be in C.P Brass, tower bolts, doorstoppers, ball bearing hinges. Locks shall be mortise of Dorset /Yale make or equivalent. Concealed copper wiring using Finolex or equivalent make with modular plate switches, centralized cabling system for all electrical and communication requirements. Wiring shall be done for lighting, 5Amps, 15 Amps and AC points in the Apartment. Switches: All switches shall be Honeywell / Legrand / Schneider /Crabtree or equivalent make. Generator: Power backup will be provided for all common services and selected light and fan point in each living, bedrooms inside apartment and a refrigerator point except Air-conditioning and Geyser points. Light fixtures for the Common areas, external areas, apartment balconies and at entrance door of the individual apartments shall be provided. Adequate ELCB and MCB shall be provided in each apartments. Provision for the GEYSER points and fresh air fans shall be provided for all toilets. Provision for telephone and Internet shall be provided in the living room and master bed room. OBD paint shall be applied in the common areas, utility, service areas. Emulsion paint shall be applied for the ceiling in apartments excluding Utility and Services. Internal Walls: Acrylic / cement based Putty with emulsion paint. Service area – Oil bound / acrylic distemper. External Walls: Whether shield exterior grade emulsion / texture paint. Elevators: High Speed lift shall be provided as per the Govt. norms in each core with automatic doors & SS brush finish of KONE or reputed make. Provisions for Split ACs, including electrical conduits and cables shall be provided for the Bedrooms, living room, family living. Access control entry to the common entrance / foyers and gymnasium. Light sensors for common areas. Home security monitoring, gas leakage detectors, emergency panic intrusion alarm, visitor tracking. Multi level security system for common areas and lobbies. Terrace gardens with sunken slab and waterproofing and drainage facility. Provision for sprinklers and a drip system shall be provided for common area landscaping. Interlock Pavers to be laid in driveways and walkways. Water bodies and fountains shall be provided as per the architect’s design. Pattom is an important part of Trivandrum city and provides an important intersection point for four roads from different parts of the city. For those lucky enough to own an apartment in Pattom, life couldn’t get easier as everything is within easy reach. Pattom is primarily a posh residential area although a few important government offices and retail outlets can also be found here. The multi-specialty SUT hospital plus a few premier educational institutions can also be found within this region. Pattom has a major bus stop which can be used to access the Central Bus Station directly in the city center. This locality is also just 4km away from the Trivandrum Central Railway Center and around 7km to the Trivandrum International Airport. All this and more, make Pattom a much-in-demand residential location. With the coastal Trivandrum city expanding at a rapid rate, apartments in Pattom are in high demand due to its great location. But when buying homes, you need to keep the builder of the flat in mind too. Since a large sum is involved and as homes are meant to last you a lifetime, you need to go with an experienced builder who has been in the game long enough. Artech Realtors have over two decades of experience in crafting luxurious homes. The Artech flats in Pattom are of premium quality and come fully loaded with branded fittings, semi-automation as well as a plethora of premium amenities intended for the discerning members of society.